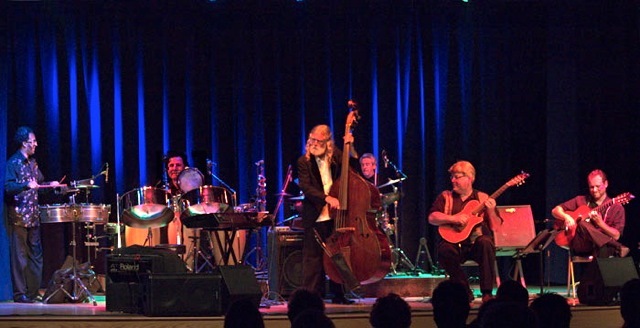 The Peter Pupping Quartet was formed in 1996 in Encinitas, California which eventually lead to the Peter Pupping Band with the addition of Kevin Koch on drums and Allan Phillips on keyboard, percussion and steal drums. In 1996 after 15 years of performing as a solo guitarist Peter scheduled a performance at a local coffee shop with then long time guitar student William Wilson. Peter and William joined forces for this “one time event” and planned an evening of classical, Spanish and flamenco guitar. When word of the performance got out one of their friends volunteered to play percussion for the Latin part of the program. The response at the concert was overwhelming and they decided to start a group. William went from student to performer very quickly and they added a bass player and a percussionist permanently. In 1999 the Peter Pupping Quartet released their first album “Samba Nights” followed two years later by “Embarcadero” which included drummer Kevin Koch. In 2004 Peter collaborated with music extraordinaire Allan Phillips in producing his first mostly all original CD. The addition of Phillips to the mix lead into a natural progression to a full six piece band. Soon after the band now called “The Peter Pupping Band” has performed at many major corporate events including an opening concert at then Coors Amphitheater for Huey Lewis sponsored by Microsoft. In 2008 the Peter Pupping Band released “Sea Journey” which nominated for best world music album at the San Diego Music awards. The band has just released it’s 2012 release “Cafe Pacifico“.